Sixty per cent of the brain is made of fat. Forty per cent of this fat is long-chain polyunsaturated fatty acids (PUFAs) and DHA is the most abundant omega-3 fatty acid in the brain. Literally it’s a no-brainer (if you’ll pardon the pun) as to why omega-3 is so important for brain health. If omega-3 is a primary structural component in the brain then this fatty acid should be a key part of our diet if we want to stay sharp and free from depression or other mental health problems. It is widely accepted that almost all disease (including mental illness) starts with inflammation but omega-3 is a powerful anti-inflammatory so it makes perfect sense to ensure we get enough omega-3. This may go a long way in explaining why omega-3 fatty acids have such a wide range of health benefits for those suffering from arthritis, asthma, depression, Alzheimer’s, ADHD or heart problems. In fact scientists have listed 61 health benefits from taking omega-3 fatty acids or ensuring we have enough in our diet. A Japanese study published in the journal, Scientific Reports, showed that fish oil also aids weight loss. The researchers fed two groups of mice fatty food with one group having fish oil added to the feed. The mice that ate the food with added fish oil gained significantly less weight and fat compared to the group without the fish oil. The scientists also measured energy burn and discovered the mice that ate the fish oil burned more calories. And that’s not all – the study also showed that the omega-3 in the fish oil caused the mice to have lower insulin and fasting glucose levels which prevents diabetes. One of the primary measures for prediabetes and diabetes is a fasting blood glucose test. The test is done in the morning to test blood glucose levels before the person has eaten. The normal range for blood glucose is 70 to 100mg/dl – anything higher than this is referred to as prediabetes. Diabetes is typically diagnosed when fasting blood sugar levels are higher than 126 mg/dl. 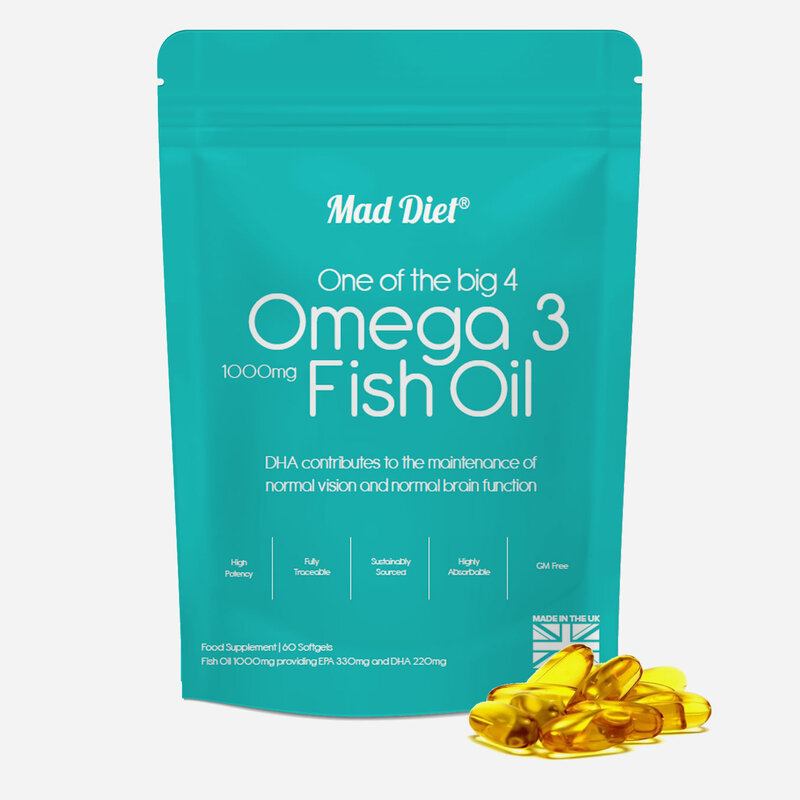 This study is just one of many that shows the powerful healing properties of omega-3 fish oils and how they not only help us (and wee fat mice) lose weight but it fends off diabetes – a disorder which now affects one in ten Americans and almost four million people in the UK. A recent YouGov study carried out for Fish is The Dish ‘Feed Your Mind’ campaign showed that 96 per cent of British adults don’t know how much omega-3 they should be getting in one week and 73 per cent didn’t know how much fish they should be eating. It’s hardly surprising therefore that most of us are deficient in omega-3. This is also exacerbated because we are also eating far too much omega-6 and this imbalance is bad for our brain and body. Just like magnesium, omega-3 gets used up pretty quickly in the body and needs to be replenished regularly in order to maintain balance and well-being. It is therefore essential that we eat a regular diet of oily fish such as: salmon, mackerel, rainbow trout, halibut, tuna, sardines and some seafood. Omega-3 fatty acids are made up of three types – α-linolenic acid (ALA) (found in plant oils), eicosapentaenoic acid (EPA), and docosahexaenoic acid (DHA) (both commonly found in marine oils). These fatty acids protect the membrane of cell walls and influence the metabolism of cells. DHA (found in fish oils and algae) is the most important omega-3 for mental health as it improves communication between brain cells – hence the dietary focus on eating oily fish. Another great source of DHA is algae which is a good choice for vegetarians and vegans. The RDA for long-chain fatty acids is 450mg per day but most of us consume around half this amount with low-income families consuming considerably less. Of course, much of this has to do with the price of fish, or often the perceived price of fish, as we often assume we can’t afford it. But fish such as mackerel, sardines or tinned tuna are still pretty cheap options. Alternatively omega-3 fish oil supplements, either in liquid form or capsules, cost pennies per day. The key consideration when choosing what supplement to buy is the concentration of EPA and DHA (the active ingredients for brain health). Even if you see 1000mg on the label this does not mean that amount of DHA and EPA is in the capsules. Look closely at the label to see how much of that 1000mg is made up of DHA and EPA. A healthy diet should include 2 portions of fish per week. This equates to an approximate daily total of 500mg of combined EPA and DHA.